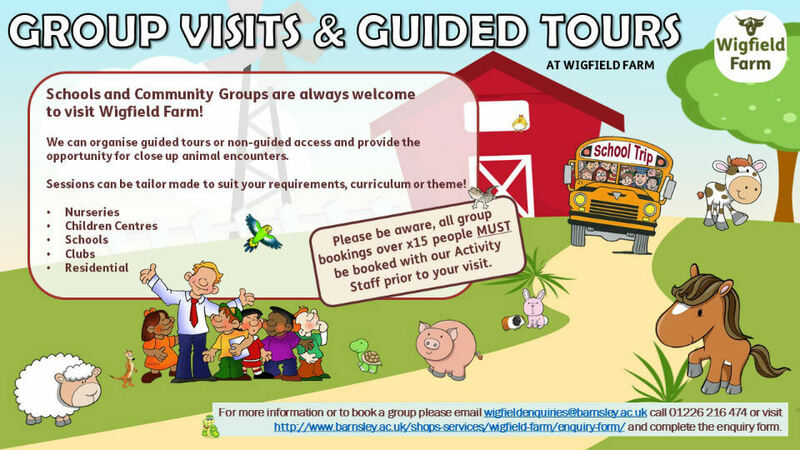 School groups and community groups are always welcome to visit Wigfield Farm. We can organise guided tours and provide the opportunity for a close up animal encounter or we can visit your premises and bring a selection of animals for you to meet. Sessions can be tailor made to suit the needs of the group and can relate to a theme or focus of your choice. We welcome all groups at the farm including nurseries, children centres and school groups, after-school clubs, beavers, cubs, scouts, rainbows, brownies, girlguides, childminder groups, mother and toddler groups and adults with learning difficulties etc. Please be aware that all group bookings with over x15 people will need to be pre-booked with a member of our Activity Staff before arriving. For more information please complete an Enquiry Form and a member of our Activity Staff will contact you regarding your requirements.